A few days after she was born in South America Maya was taken by her birth mother to the city and left at a home for abandoned babies, being adopted shortly after by her parents who lived in the United States. As a small child Maya instinctively journeys “My being would dissolve into another reality more tangible than my daily life. It was a dream-world of adventures, conversations and friendships, but I was not dreaming. I was wide awake” but as the years pass slowly Maya spends less time in nature, more time in school and this reality fades away. ‘Lightning strikes’ when she turns 30. Bedridden from an auto-immune disease Maya hears the call to return to the home of her ancestors for healing. 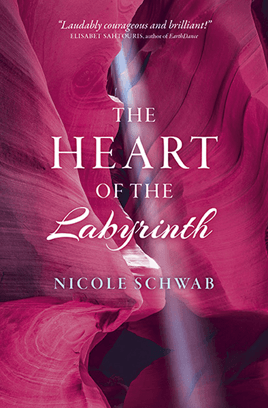 Beautifully written, The Heart of the Labyrinth weaves an enchanting and evocative contemporary parable. Read it to go on a journey with Maya: through her lessons with her teacher and guide, Saywa, and with the mysterious Sage; through her visions and dreams; across cultures and into the heart of the labyrinth to the voice of the divine feminine, Gaia.